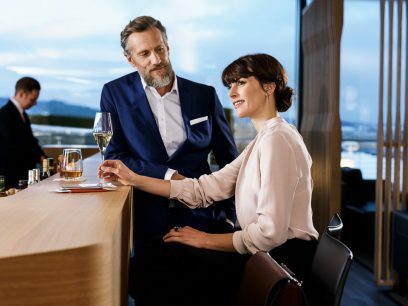 Lufthansa & SWISS airlines (Lufthansa Group) have recently joined forces with Singapore Airlines to make the long trek from Australia a seamless first class experience to Europe. When you hold a first-class ticket on a Lufthansa commercial flight, or on one of their Private Jets, you can unwind in an oasis-like setting and enjoy peace and relaxation before your flight. There are Lufthansa First Class departure, transit, and arrival lounges at Frankfurt, Munich, Zurich, Geneva, or Vienna Airports (for example). Exclusive first-class facilities are available at Tokyo Narita and New York (JFK) airports. Go from the sanctuary of the Lufthansa First Class lounge straight to your aircraft without a fuss and in no time at all. In Frankfurt, Munich, Zurich, Geneva, or Vienna you are chauffeur driven from the Lufthansa First Class lounge directly to your aircraft or private jet in a limousine or in an exclusive minivan. It’s boarding the way it should be. The ease and repose continue on-board Lufthansa first class. You can feel the sumptuous offerings in every detail from the décor to the customised service. The cabin design is elegant and timeless using the highest quality materials with lighting made to cater to your senses. For your every comfort, sound is insulated, and privacy screens ensure your precious time is yours alone. Combine this with Lufthansa’s renowned service and your time above the clouds is one you’ll not soon forget. Indulge in the culinary on-board dining that includes an exquisite caviar service that simply comes standard on a Lufthansa first class flight. If you’re on a day or evening flight, you can choose to relish this indulgence as a separate course. 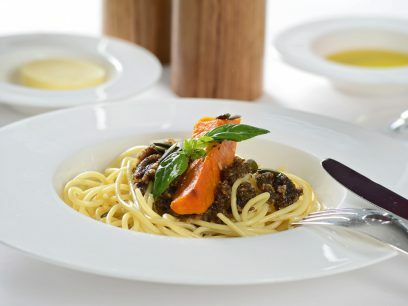 In addition, you can enjoy a different entrée with a selection of small savoury dishes. A seamless first class experience travelling on a Lufthansa ticket starts with a Singapore Airlines first-class flight to Singapore. From here you board a Lufthansa first-class service to Frankfurt, before finishing in Nice or Copenhagen. On the return you can depart from either Florence or Linate on-board a Singapore-bound Lufthansa flight via Frankfurt and return to Sydney on Singapore Airlines. SWISS have departure, transfer, and arrival First Lounges to keep you touched up and refreshed throughout the duration of your flight. Escape the commotion of busy international airports with a pre-flight dinner, or in the quiet of a comfortable meeting room. You are whisked to these facilities via a private shuttle service. Prepare to be spoiled by SWISS hospitality – a prelude to what’s to come on board. SWISS first-class seats offer more than just comfort – it’s your own personal compartment in the sky that completely adapts to your needs. In the seating position, you have a variety of adjustments to choose from and when you’re ready for sleep it transforms into a completely horizontal bed. Travel in more than just comfort – travel the way you want. Experience a taste of the land famed for its chocolate with the SWISS Taste of Switzerland gastronomic concept which offers top-notch inflight dining. The menus are developed exclusively for SWISS by celebrated chefs and feature regional specialties made from ingredients which are cultivated and produced in those particular locations. Sample the unique culinary pleasures of Switzerland on-board a SWISS first-class flight. Your seamless first class journey from Sydney with SWISS airlines begins on a Singapore Airlines first-class flight to Singapore. Then it’s on to Zurich on SWISS, and can finish in either Lisbon or London Heathrow. On the return trip, you can depart from either Amsterdam or Paris Charles De Gaulle on SWISS en route to Singapore via Zurich, before re-boarding a Singapore Airlines aircraft to return to Sydney. 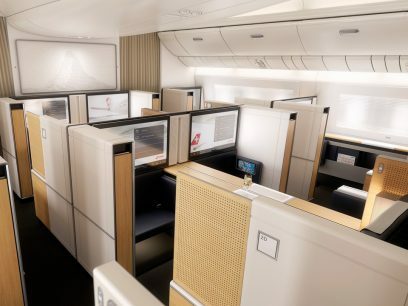 SWISS and Lufthansa’s new partnership with Singapore Airlines means you can travel long-haul in real style. It means you have an uninterrupted first-class service from Australia all the way through to Europe, taking advantage of Singapore Airline’s award-winning first-class Suites.